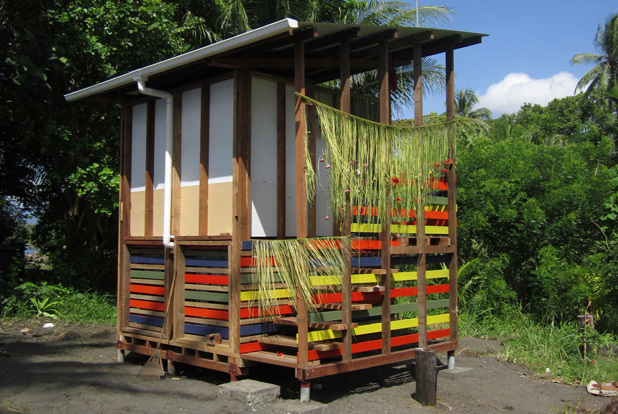 Over a ten-day period in November 2012 the University of Melbourne joined with the University of Technology Lae and the Sipaia community to build three innovative composting toilets. The two universities had previously worked together in 2010 developing a pilot project to provide fresh drinking water in two communities. The success of that project led to the formation of a new team of eighteen masters level architecture and landscape architecture students from Melbourne and Lae working alongside Sipaia residents. Poor access to sanitary hardware is contributing to ongoing health problems for residents of the seaside communities in Lae. Existing toilet facilities, inadequate to the needs of the community, do not properly deal with human waste and are unsafe at night. With funding from the Australian High Commission in Port Moresby the team designed and constructed the toilets to improve the health and well being of the community and test new ways to minimise the impact of human waste on the environment. Our newly improved toilet facilities provide a secure place to collect and treat waste and remain unaffected by tides or floods. They are lit with solar lights at night, are constructed with community assistance and are locally managed in such a way as to ensure that the overall project remains sustainable over the long-term. The structures use locally available and inexpensive materials. The design is more complex than standard pit toilets but they are far more pleasant to use, require less maintenance and are less polluting for the environment. This is particularly important given the effects of climate change upon vulnerable coastal communities. Most importantly good hygiene, including the ability to wash hands after defecation, reduces the spread of cholera, dysentery, malaria and schistosomiasis. The system for collecting and managing waste uses cutting edge and proven technology that requires no water and minimal maintenance. They allow for the water collected from the roof of the facility to be used for hand washing and for drinking. This also leads to improved health outcomes and adds another dimension to the project’s importance. Both universities view the project as a prototype for the development of further health hardware in other marginalized communities within Papua New Guinea. The involvement of the local community in the construction phase, coupled with the stipulation that the community be responsible for the ongoing maintenance and economic sustainability of the ablution facility, serves as a model for additional sustainable development projects. Bower Studio thanks the people of Sipaia for welcoming the team into their community.